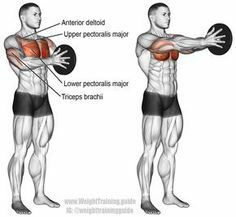 The first chest workout is dumbbell chest press, this workout hits almost all of your pectoral muscles including your tri-cep. For this exercise, you will need to hoist two dumbbells up while you lay down flat on a bench. Once both dumbbells are in the air, you will slowly lower them until you arms form 90 degree angles. After that, you will then push the dumbbells back up to their starting position. To ensure your safety, make sure that you have a spotter along side you incase you arms either give out, or you are two weak to move the dumbbells back up. The dumbbell chest press is pictured below. The next exercise that you will do during your workout will be decline dumbbell squeeze press. This workout is best used directly after dumbbell chest press, or even used as super-set with dumbbell chest press. In the diagram below, you will find that this exercise is much like dumbbell chest press, but instead of the dumbbells being out to your side, the will be squeezed together. To complete this rep, you will need to stop right before touching your chest and then go straight back up to the original position. The diagram for this workout is below. The third exercise that you will perform during this workout is call dumbbell fly’s. This work out is very good at stretching you chest muscles in order to maximize growth. To perform dumbbell fly’s, you will first need two dumbbells and then hoist them over your head while you are lying down on a bench. Then you will slowly move the dumbbell outward with little no elbow movement. Once you have the dumbbells way out to your side, you will slowly raise them back up towards each other. when you are about to finish this rep, make sure you do not touch the dumbbells together at the top. This exercise was hard to explain, so if you do not know how to do it there is a diagram below for dumbbell fly’s. Now that you are half way through this short workout, you will need to move from the dumbbell area and go towards the cable towers. Once you are at the cable towers you will perform the exercise called cable fly’s. This exercise is very similar to dumbbell fly’s, but with cable fly’s has many different key aspects from dumbbell fly’s. For this exercise you will need to move the arms of the cable machine to shoulder length. Once this is complete, you will find the handle attachment to put onto the arm. Then you will set your weight to a preferred weight and grab both cable attachments and pull them together with little to no elbow movement. The diagram for cable fly’s is below. The fifth exercise for your chest workout is simple, and you have probably done it before. This exercise is called barbell chest press, and after the first four exercises, this exercise can be difficult. But, if you have never done the exercise shown below, here is how it is done. You will first grab the barbell at shoulder length apart and make sure that your grip is centered. Once you have you grip set, you will then need to take the barbell off of the rack and move it over, above your chest. Then you should slowly lower the barbell all the way down, but make sure you stop lowering right before you hit your chest. Finally, you will push the barbell back up to the top. The diagram for this exercise is below. The final exercise that you will perform is an S-Vend press. This exercise can be hard to do at the beginning of a workout, let alone at the end. To do this exercise, you will first grab a plate and squeeze it with both hands flat. Then you will slowly extend your arms straight while squeezing the plate. Lastly, you will get reach out till you can no longer extend you are are then you should retract your arms to the original starting position. The diagram for this exercise is below.